Moving to a new location definitively completed? At the end of last year, we announced the information about the King Arms company moving from Hong Kong to Taiwan. Then we reported about their participation in the Taiwanese MOA fair. At present, it seems that all organizational issues of King Arms are already behind them and the company intensifies its efforts to return to the game for good. We have just received information about several new products and also about refreshed ones. 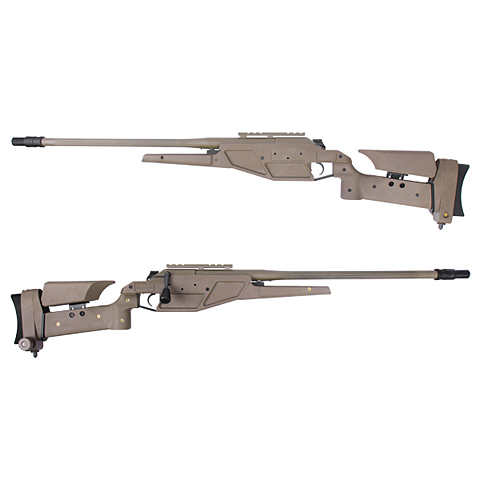 First its a series of K93 LRS1 spring powered sniper rifles. The LRS1 (Long Range Sporter 1) are interestingly designed rifles, in which instead of the classic bolt action with uses four moves to complete the reloading cycle, a solution requiring only two moves was used - just back and forward. The stock is made of composites. The length of the inner barrel: 495 mm, the weight: 3170 g, magazine capacity: 50 BBs. 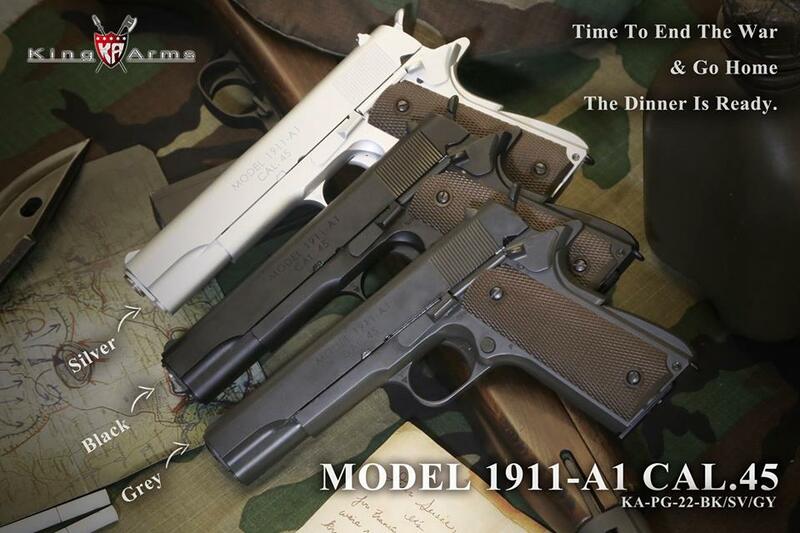 There are two versions: Elite and Ultra Grade differing slightly with the reloading handle, the shape of the outer barrel and the muzzle break. In addition, in the Elite version we have a choice between a black or a DE color. 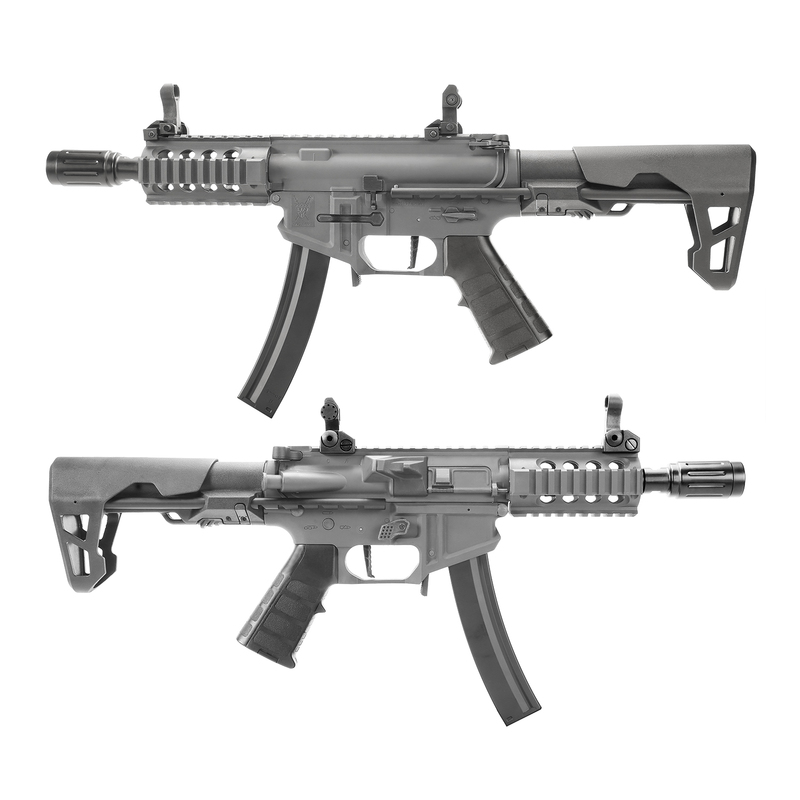 Another information concerns the M4 TWS (Training Weapon System) electric carbines. We have a choice between three barrel lengths version: Dinosaur - 475 mm, carbine - 410 mm and CQB - 370 mm. 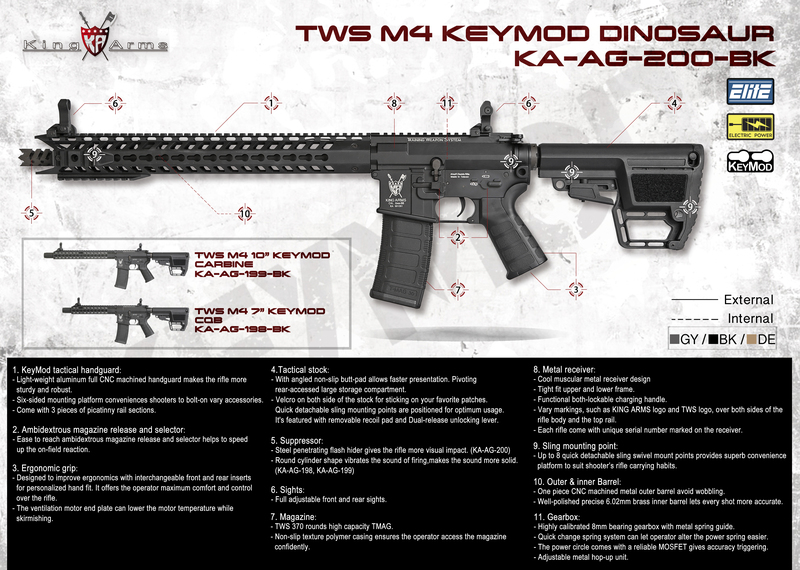 There are also different lengths of the aluminum front grip which uses the Keymod system, the longest (Dinosaur) also has a different ending. Common for all models are: the V2 gearbox with 8 mm ball bearings and a quick spring replacement system, an electrical wiring equipped with a MOSFET, a modular pistol grip with replaceable panels (two extra panels are included in the set), a functional magazine release, a one-piece outer barrel and a hi-cap magazine (TWS) holding 370 BBs. The length of the replicas (folded/unfolded stock): Dinosaur - 870/950 mm, carbine - 850/930 mm, CQB - 835/750. Weight (as appropriate): 2900/3030/2760 g. Muzzle velocity: 380-420 fps. Each replica is available in black, gray (gun metal) and sand (DE) colors. 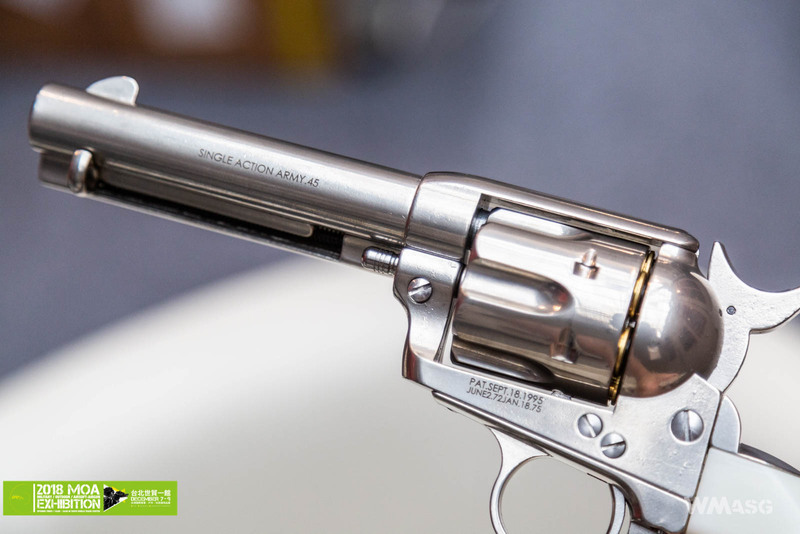 While reporting the participation of King Arms in the MOA fair we wrote about gas powered Colt SAA .45 Peacemaker replicas - exactly the ones used by General G. Patton. The revolver uses green gas. The BBs are loaded individually into brass dummy cartridges placed in the drum. 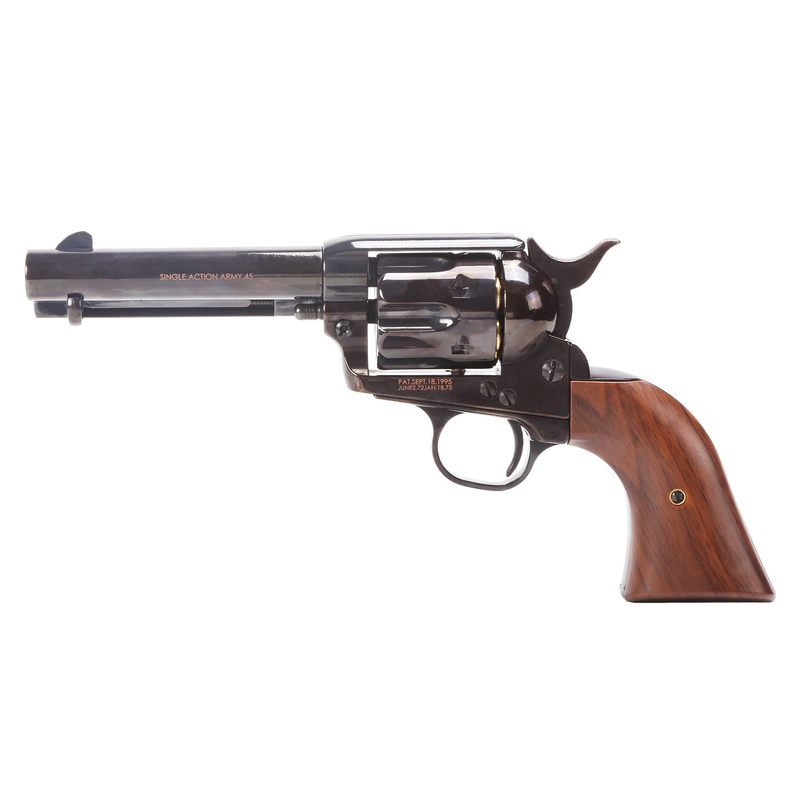 Currently, King Arms offer includes two versions of the revolver: S with a 4 inch barrel and M with a 6 inch barrel. Common features: completely metal design, green gas tank inside the grip, drum holding six cartridges, ejector mechanism, precision barrel 6.03 mm long. Overall length: (S/M): 253/306 mm, length of the inner barrel (S/M): 117/166 mm. 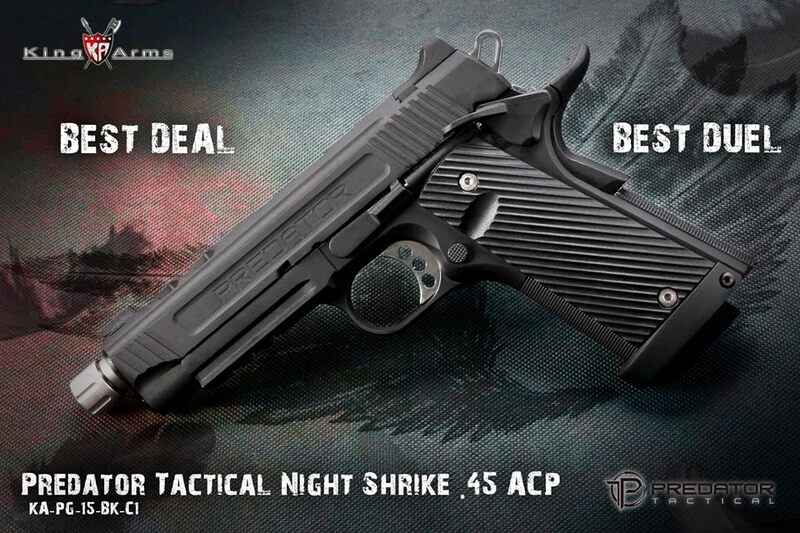 Weight: (S/M): 836/873 g. Muzzle velocity: S - 250-290 fps, M - 290-330 fps. Revolvers are available in two variants: a Limited Edition - with a Cerakote coating and a standard version - in chrome, galvanized black, matte black and opalescent. 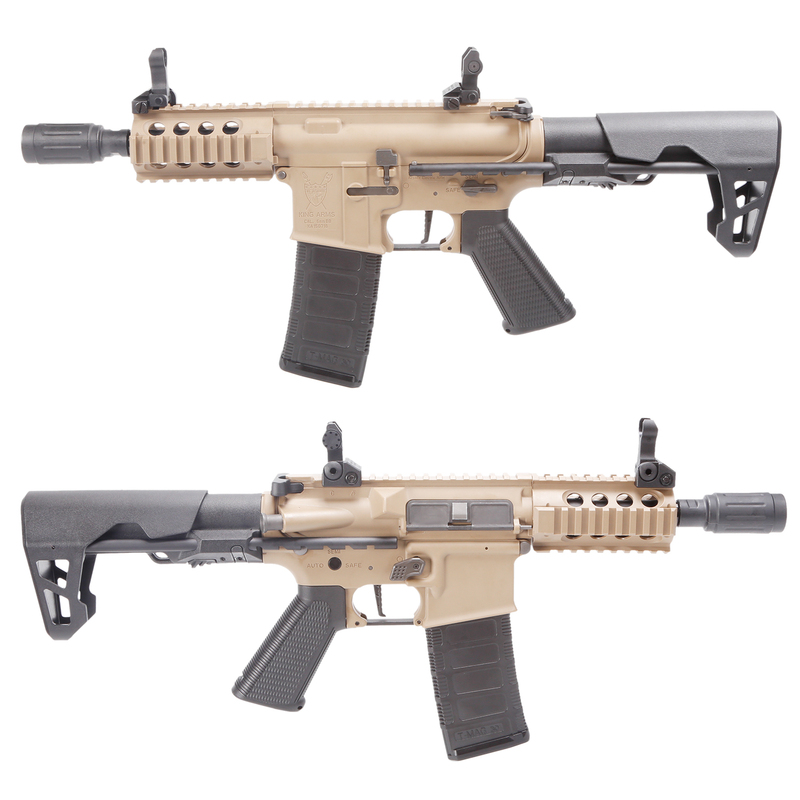 PDW SBR in 5,56 and 9 mm versions. 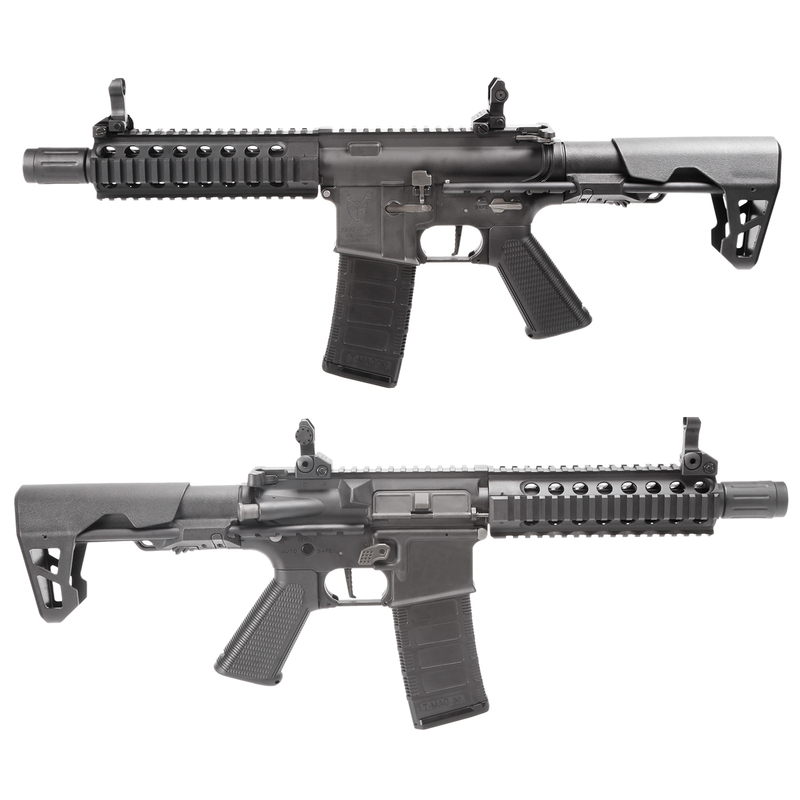 The SBR 5,56 long (black) and shorty (DE). The receivers are made of polymer, they have brass inner barrels with a diameter of 6.05 mm. The mechanism based on the V2 gearbox with 7 mm bearings and electrical wiring equipped with a MOSFET. They have mid-cap magazines with a capacity of 100 (9 mm) or 140 (5.56) BBs. Muzzle velocity: 380-420 fps. 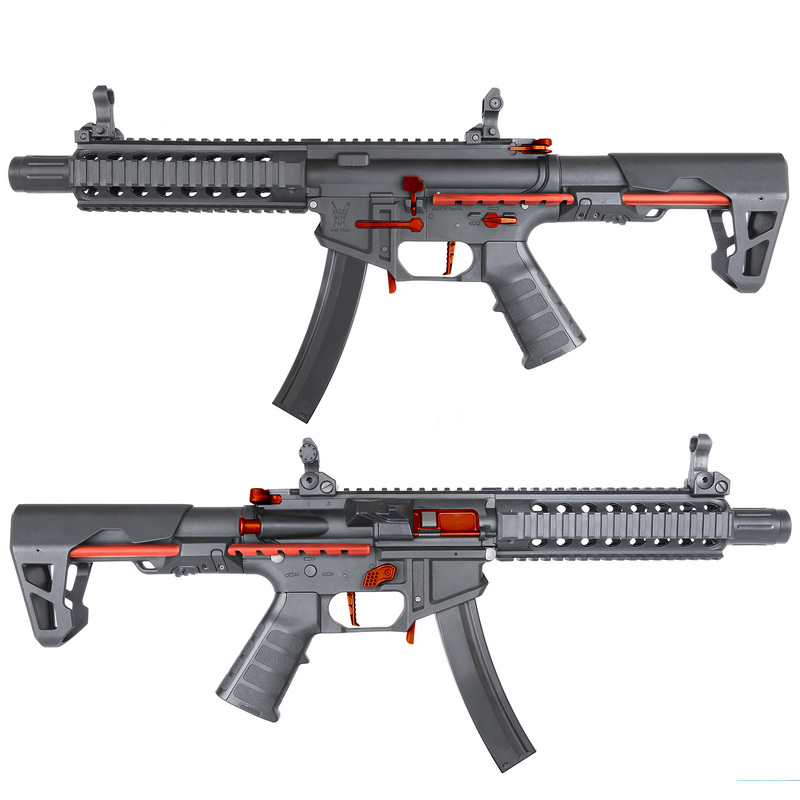 Recently, the 9 mm versions appeared with colorful (red or blue) parts. The buttstock guides, the switches and the ejector window flaps may also be colored. The real novelty, however, are the PG-20 and PG-21 pistols, which resemble the Glock pistols. Power supply: green gas. 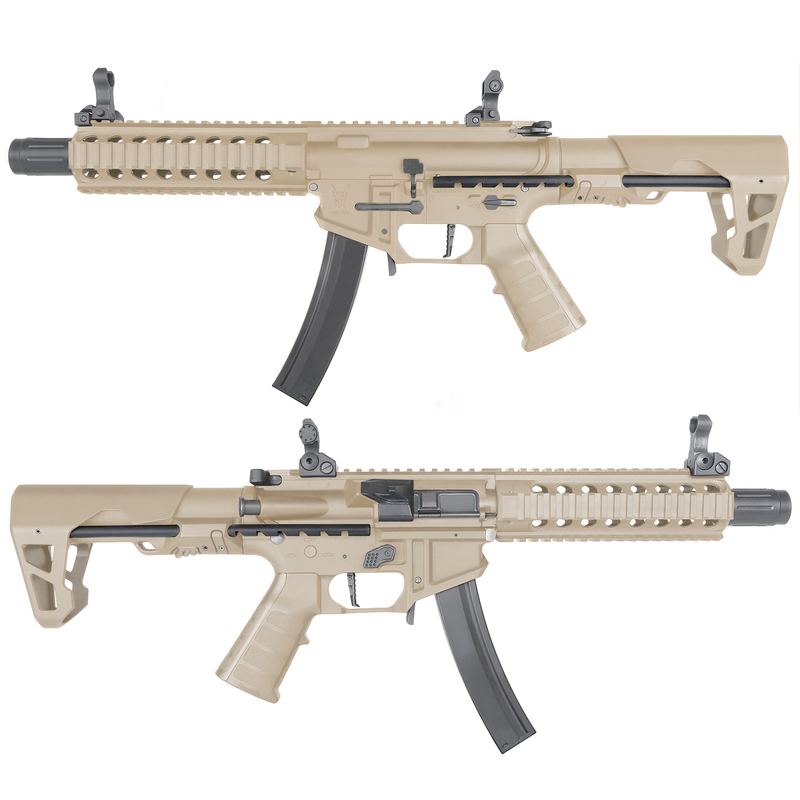 Common features: polymer frames, aluminum slides and one-piece external barrels, brass inner barrels with a diameter of 6.05 mm. 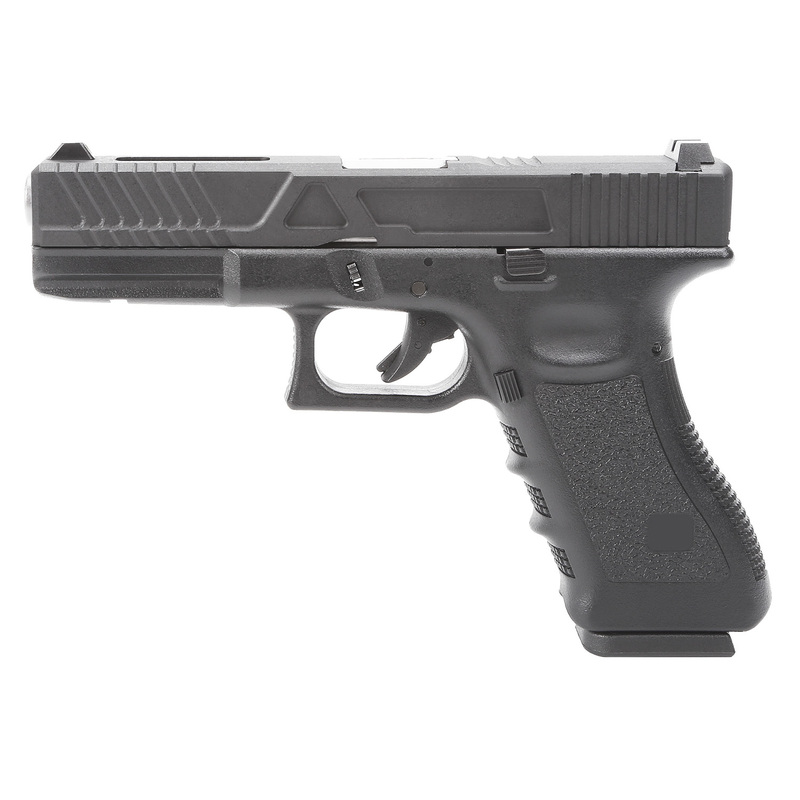 Overall length: 213 mm, length of the inner barrel: 113.4 mm, magazine capacity: 24 + 1, magazines are compatible with Tokyo Marui Glock pistol replica magazines. Muzzle velocity: 285-310 fps. 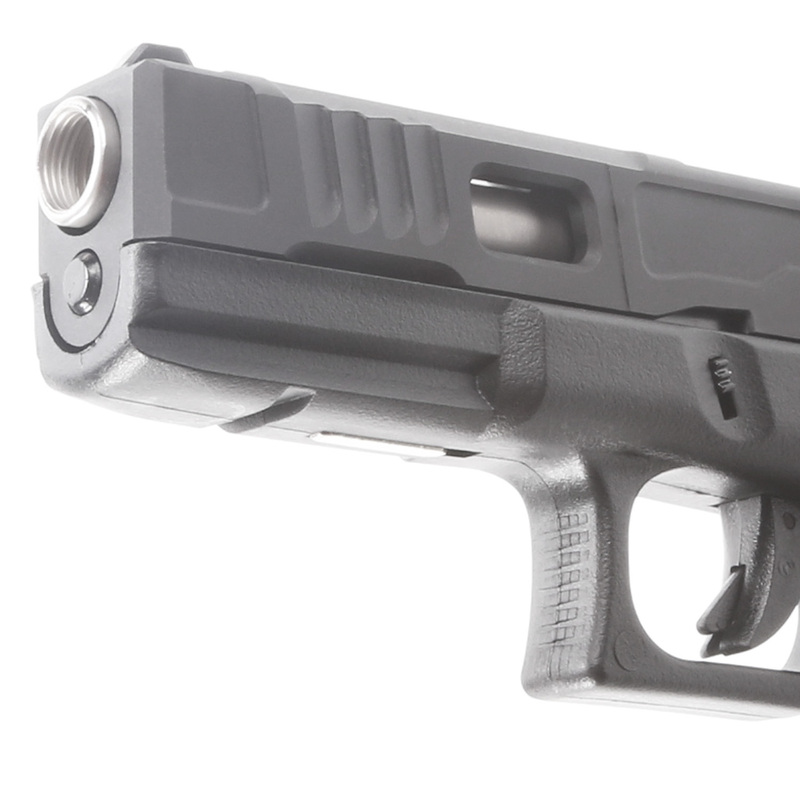 The pistols are made in plain black and two-color versions: black and sand, black and silver, and sand and silver. And finally a new announcement. In the near future there will be two more green gas guns available.